There have been no important economic reports to influence NZDUSD and this pair also ignored weak Electronic Card Retail Sales report. 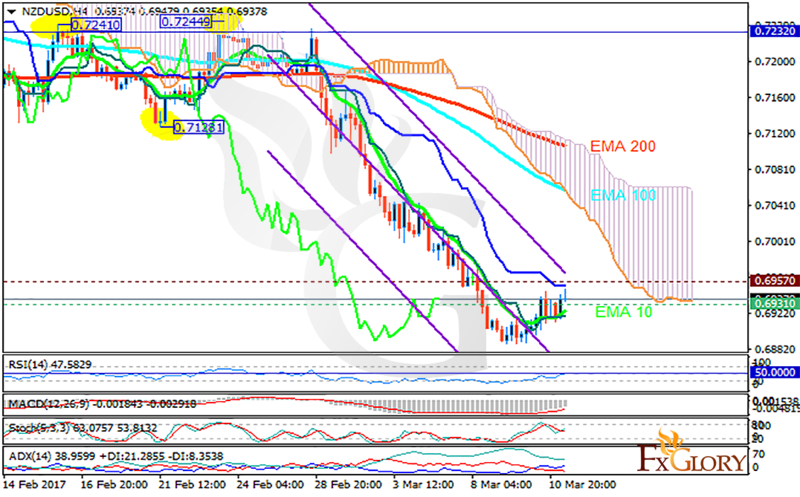 The support rests in 0.69310 with resistance at 0.69570 which both lines are below the monthly pivot point at 0.72320. The EMA of 10 is moving with bullish bias but it is below the EMA of 200 and the EMA of 100. The RSI is rising towards the 50 level, the MACD indicator is in negative territory and the Stochastic is showing upward momentum. The ADX is showing strong buy signals. The price is below the Ichimoku Cloud and above the Chinkou Span. The Tenkan-sen and the Kijun-sen are both showing a horizontal trend. The support level breakthrough will smooth the way for further decline targeting 0.6850, otherwise the pair will grow to 0.70.